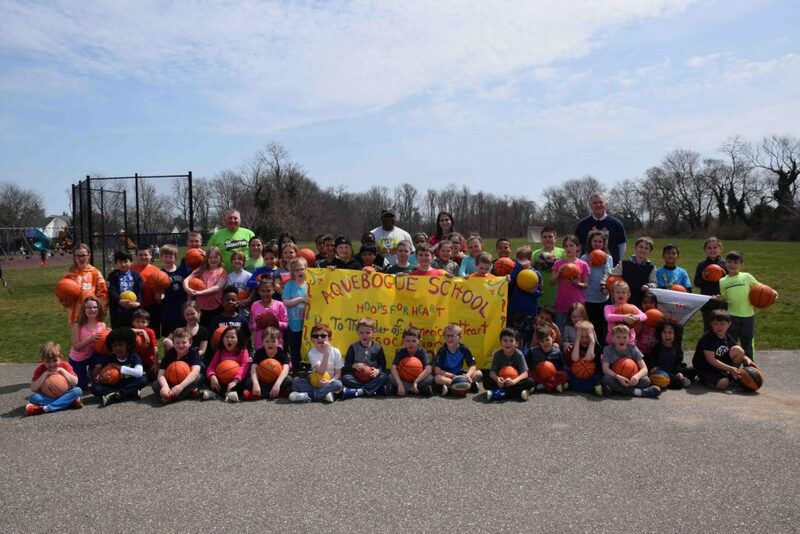 Students at Riverhead School District’s Aquebogue Elementary School improved their jump shots and heart health as part of a fundraiser for the American Heart Association’s Hoops for Heart program. As part of the community service project, students raised $5,024 in sponsorships to make as many jump shots as they could during a 30-minute Super Shooter contest on April 9. Leading up to the culminating event, students in all grades, during the months of March and April, learned the fundamentals of basketball, about heart health and ways they could make a difference in the lives of those with heart conditions. “We are so proud of TEAM Aquebogue, the school where together everyone achieves more,” said Principal Phil Kent. Photo caption: Riverhead School District students at Aquebogue Elementary School raised more than $5,000 through a Hoops for Heart fundraiser.